(4/10/19) Disney is adding a new twist to their Disney After Hours separate ticket events at the Magic Kingdom on select nights from June 6 through Aug. 8th, by letting their Villain characters out to run the park. They are calling this “Disney Villains After Hours” and tickets will go online starting April 29th, though I’m told that the price is expected to increase compared to the non-Villains themed events. The new Villain themed event will add a new Disney Villains stage show called Villains Unite the Night, the steam-punk Maleficent the Dragon will be let loose in the park, new villain inspired additions will be made to Pirates and Space Mountain and more. (3/20/19) Long before the Leave a Legacy monoliths were added to the entrance plaza of Epcot, Walt Disney World’s first opportunity for guests to leave a personalized mark on the property came in the form of Disney’s Walk Around the World bricks which cover the pathways in front of The Magic Kingdom, along with some more over at the TTC. According to the latest statement from Disney, these bricks will soon be “retired” as the various pathways are improved and reconfigued over the upcoming months. Unfortunately there will not be an opportunity for anyone to salvage their bricks, as they were “not designed to be removed individually”. Instead guests who sponsored a brick will be given the opportunity to purchase a commemorative version of their brick between now and August 31, 2019… or while supplies last. For instructions on what to do if you are interested, click here. The price before shipping is said to be $10. For anyone who never got a chance to buy one back in the day, you too can have a custom commemorative brick created to have at home for $29.99. Follow the same link for details on where it can be bought at the parks right now, or watch for them to go on sale at shopDisney.com later this Spring. (11/20/18) I'm not sure when it happened, but while visiting the Magic Kingdom on Thursday, Nov. 15th, we rode Space Mountain and noticed that they had gone back to using the traditional exit pathway out of the attraction. As rumored there is now no longer any kind of moving pathway, but instead a nice freshly carpeted pathway is in place following the old exit through, down and up out of the mountain and into the gift shop. The path only changes towards the end of the journey where some switchbacks were installed to make the incline less steep than it was previously, with the exit into the gift shop now placed closer to the old arcade location rather than in the front of the gift shop. The old scenes at the start of the exit pathway (formerly referred to as RYCA-1 once upon a time) are still in place as they were before. You can see a video showing off the last portion of the pathway posted to Twitter below. (9/4/18) Blog Mickey has posted some new photos showing off the exterior of the new Club 33 building inside the Magic Kingdom, now unobstructed by construction walls. While you can only see the outside, it does seem to feature a second story balcony aimed perfectly for nighttime fireworks viewing. 2018 - Pirates Of The Caribbean Update - (3/21/18) Pirates of the Caribbean has reopened from the long rehab, and you can see a video of the full ride here (shot by Attractions Magazine) but if you just want to see what happened to the old auction scene, look below and you can see the new version of the scene where the pirates chant, "We wants the rum!" instead of "We wants the Redhead!". 2019 - Mickey & Minnie's Surprise Celebration - (9/24/18) Walt Disney World has announced a number of new and limited-time experiences coming to their parks in 2019. At the Magic Kingdom this will involve Mickey & Minnie's Surprise Celebration (a new music/dance production), along with the "Move It! Shake It! MousekeDance It! Street Party" starting Jan. 18th. Meanwhile you can also expect some secret "Limited-Time Magic" events throughout the year. 2021 - Tron Light Cycle Coaster / Tomorrowland Update - (3/19/19) We can look forward to seeing the steel of the Tron coaster at the Magic Kingdom soon begin to rise. According to a posting at the Disney Parks Blog, Cast Members were invited to sign their names on one of the first steel supports for the ride that has arrived on property. (1/11/19) New photos posted to WDWNT show that a big section of the Tomorrowland Speedway has now been torn out to make way for construction on the new Tron Lightcycle coaster project. Don’t worry, the Speedway will return eventually… though personally I think they should have taken the opportunity to totally vamp the Speedway into a Sugar Rush themed race ride from the Wreck It Ralph films. The two attractions would have fit in nicely next to each other I think. (12/17/18) A reader visiting the Magic Kingdom this weekend sent in a quick photo of a section of the railroad in front of the future Tron coaster site where the tracks have now been completely removed. (10/20/18) For those wondering how things are progressing on the Tron coaster at The Magic Kingdom, Blog Mickey has posted a quick update with some new aerial photos of the site. In short… the site is cleared and they’re still in what I like to call the “dirt pushing phase”. Mainly this is because they are re-routing the waterway that goes between the site and the park to take a new path alongside the road (with some open and underground tunnels sections) so they can fill in the current waterway for the building. (8/15/18) A quick update on the upcoming attraction closures to make way for the new Tron attraction in 2021. According to the local news when the railroad closes this December the train will stay in the Main Street station and offer guests a unique close-up tour of the train, along with some special photo ops you wouldn’t normally get. Again, no word on how long this may be offered. Meanwhile the Tomorrowland Speedway will close down sometime in early 2019, but is expected to be reopen once again by Summer 2019. (8/11/18) Word is that the Walt Disney World Railroad will close for a time, starting in December, to allow for some needed construction around where the new Tron coaster is going in Tomorrowland. I'm not sure if this is just to allow for work across this area, or if some track realignment will be necessary, but the reports also claim that sometime in early 2019 the Tomorrowland Speedway will also need to be closed for a period of time for the same reason. I’m not sure how long the Railroad itself may be closed for either... as in the past the park has been known to run the railroad in a backwards/forwards shuttle mode to allow for construction at times, and could very well opt to run from Main Street over to the Fantasyland/Storybook Circus station and then backwards back to Main Street for a period of time between now and 2021 while the Tron attraction is being built. (6/28/18) Orlando Weekly has posted an interesting collection of rumors regarding the future of Tomorrowland. According to the report, we may see some other upgrades happen in Tomorrowland along with the addition of the new Tron coaster by 2021. Longtime readers will remember the early prediction was that the Tomorrowland Speedway was going to be removed, and likely used as the location for the Tron coaster before the official announcement placed it behind across the railroad tracks, sparing the Speedway. The latest rumors claims that the Speedway itself may also get a Tron make-over with slick new cars being added (maybe electric?) that will feature an impressive Tron inspired on-board lighting package, and likely some new scenic props on the course. Other current Disney properties could also be used for course themeing as well such as Wreck-It-Ralph and Incredibles. (Me? As much as I love Tron, I'm still trying to figure out why they don't just give the Speedway a full "Sugar Rush" themed makeover instead to tie it into the Wreck-It-Ralph films. Who wouldn't like to see the crazy candy themed race-cars racing through the colorful world of sweets, past an erupting Diet Cola Mountain. Back to the new Tomorrowland rumors... these claim that the Carousel of Progress may have a new upgrade being planned to replace the 1990's era finale scene in the attraction with something more up-to-date. Other possible rumors include putting a new attraction of some kind inside the former Stitch's Great Escape building, adding some kind of new update to the Peoplemover that would bring a 'story' to the attraction. One line of thought may be to give it an Incredible's theme... which was once a failed proposal to bring the closed Peoplemover in Disneyland back to life many years ago. For now these are just rumors, but the clock is ticking to the 50th Anniversary, so any work needed to be done would have to begin within the next 6-12 months most likely. (11/23/17) Looks like Disney is ready to begin moving forward with the Tron and new Broadway style performance theater at The Magic Kingdom as new permits have been filed online mainly detailing how the land will be used and modified in terms of water drainage for both projects along the eastern perimeter of the park, though you can see where the new attraction structures will be placed and their basic shape. You can download a PDF showing off the latest info here. With the first plans now on the books, I’d expect to see initial site clearing start sometime in the next 3-4 months. (7/20/17) Fans of TRON, your day has come, because Disney confirmed at the D23 Expo that a copy of the Tron Lightcycle Power Run coaster attraction will indeed be coming to the Magic Kingdom in time for the 50th Anniversary of WDW in 2021. The Speedway will survive however, as Tron will be placed just to the left of Space Mountain, with the main attraction building residing on the other side of the railroad tracks, just like Space Mountain. I've got a feeling we'll see some renovations take place on the Tomorrowland Speedway, along with a reconfiguration of the track layout, in order to accommodate the new Tron coaster. Now... can we talk about putting a third Tron film onto the production slate as well? (7/13/17) A new rumor floated my way about a possible new location for the Tron coaster. According to the latest buzz, Disney may have backed off in the idea of closing down the Tomorrowland Speedway for the coaster. Instead rumor has it they may remove the Cast Member parking lot located in the empty lot between Carousel of Progress and the exit of Buzz Lightyear, which was the former home to the Galaxy Palace Theater many years ago. The theater was removed back in 2009 I believe and replaced with a CM parking lot for upper management types but it could revert back to use for the park and serve as a nice hidden backstage location for the large show building required for the Tron coaster, and leave the outdoor portion of the ride free to buzz out into the plaza between CoP and the Peoplemover station. Speaking of which… I’m hearing now that the roof over the coaster’s outdoor section was not budget cut after all, as the ride would need it to avoid shutdowns during every rain storm. (7/12/17) Let the budget cutting begin... because while the Tron coaster project hasn't even been confirmed for Walt Disney World yet, the latest rumors suggest that the WDW bean counters have already got ahold of it and figured the quickest way to cut the budget on the project was to remove the huge light-up canopy/roof structure that covers the entrance and outdoor portion of the ride. (7/11/17) Remember awhile back there was a rumor going around claiming that a copy of the Tron Lightcycle themed roller coaster from Shanghai Disneyland was going come to Tomorrowland and replace the Tomorrowland Speedway? While it was looked into, at the time, my sources indicated that it just was not going to happen. Just from the available space… it really was going to take a giant shoehorn to make it fit, as the space available from removing the Speedway alone is just not big enough for more than the indoor portion of the ride, but there is that huge outdoor section of the ride with the giant roof covering to deal with. That all didn’t stop the Disney fans from talking and talking about how much much they really wanted the Tron coaster in Tomorrowland however. Well… if the latest rumors are true, “for the first time in forever” Disney management may have decided to give the fans what they really wanted. According to the scuttlebut being posted over at WDWNT, they announcement confirming that the Tron coaster is coming could happen as early as this Saturday at the D23 Expo. We’ll have to wait and see just how this all works out, but if true you can expect to see the Tomorrowland Speedway shut down sometime in 2018 so they can begin working on it, hopefully in time to open it by 2021, just in time for the start of Walt Disney World’s big 50th Birthday celebration. Then again, I’ve also heard this may not open until 2023… so we’ll have to wait and see if they’ve opted to bump it up the timeline or not. 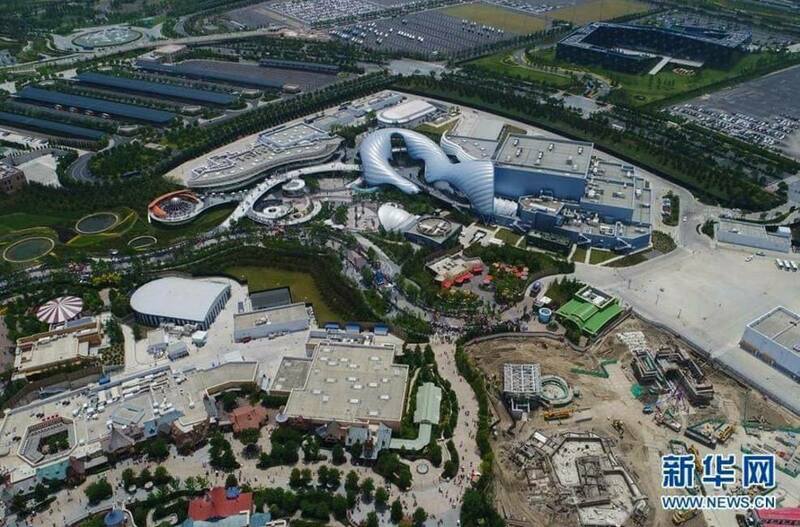 I am curious to see how they can place it in the space available if they do clone the existing attraction in Shanghai. Me? I’d love a slightly longer coaster experience, or one with two truely dueling tracks… but the chances of that happened are slim to none at this point. I did create a few layout maps showing off some possible placement ideas of how they could place the existing attraction over the current Tomorrowland layout. I kind of like the first idea the best, where it gives them the option of incorporating the nearby TTA/PeopleMover so it could potentially travel INSIDE the Tron coaster attraction giving riders a very cool new view on the action inside before moving on to go inside Space Mountain. This layout would also allow the outdoor portion of the Tron coaster to fly up and over the entrance plaza of Space Mountain as well… though to incorporate all of this here, the exit building of Space Mountain may have to be altered a bit to make this all fit, along with allowing enough clearance for the Peoplemover to still pass in and out of Space Mountain while passing by Tron in each direction. The end result would create a very cool looking plaza area with a lot of dynamic movement though, with Tron, Peoplemover cars buzzing by each other and Space Mountain looming nearby. 2021 - 50th Anniversary Celebration / Park Expansion - Rumor - (10/26/16) According to Screamscape sources Walt Disney World may be planning some special treats for the Magic Kingdom when the park celebrates the big 50th Anniversary starting in Oct. 2021. From what I’m told, to help celebrate the 50th, each of the park’s major attractions will be given "a little extra magic" to make the park experience better than ever for the big celebration. Take that for what you will... though it kind of reminds me a little of what they did for Walt’s 100th Birthday celebration, where each park got a magical present in the form of a new attraction from another Disney park elsewhere in the world. ???? - Haunted Mansion Hotel - Rumored Proposal - (7/14/17) While nothing has been officially set in stone regarding the building of a Star Wars themed hotel in Walt Disney World outside the Studios park, a brief conversation about it resulted in another fascinating bit of information. Towards the end of my article about the Star Wars Hotel I recalled a bit of information about how Disney had previously pitched another resort concept years before that would have been themed to the Haunted Mansion. If you haven't read that story yet, you might want to go read it first and come back. A little birdie has told me that Disney uncovered and went over those old Haunted Mansion Hotel plans while they were working on the Star Wars Hotel proposal and if the Star Wars Hotel gets approved and turns out to be a big hit, Disney is now eyeballing some land behind the Haunted Mansion itself where they could actually build an on-site hotel in the future. While there isn't a ton of room back there right now, they were apparently inspired by the reshaping of the Rivers of America project at Disneyland that helped reclaim some land for their Star Wars Land by shortening the river. If they opt to go ahead with a Haunted themed hotel experience, they will likely do the same thing to the Magic Kingdom at some point in the future in order to increase the amount of land available for park use.